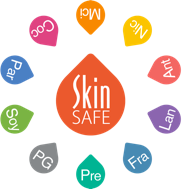 Patients rely on SkinSAFE for product recommendations, ingredient transparency, and treatment adherence. Ever-growing collection of beauty, skincare, and personal care products powered by our intelligent algorithm and consumer submissions. One intuitive platform to manage patient’s allergens and cross reactors, with flexible controls for easy customization. Free support, free onboarding, and free training so you can focus on providing the best possible care for your patients. A clear and accessible way to help consumers get fact-based, consistent, and up-to-date product and ingredient information. Sign up today to get free access to SkinSAFE as a member of the DNA!